Get ready for the Chanukah concert to end all Chanukah concerts, featuring the New York Boys Choir, taking place at 8:30 PM this Motzei Shabbos, December 31st at the YIWB Sha’ar Hashomayim of Bayswater. 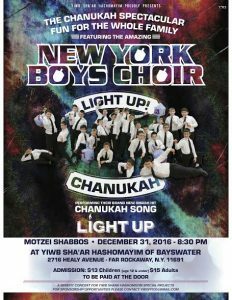 The ever popular NYBC will be performing their all new Chanukah song, Light Up, in addition to many of their other hits. Tickets available at the door only, with admission $13 for children and $15 for adults.